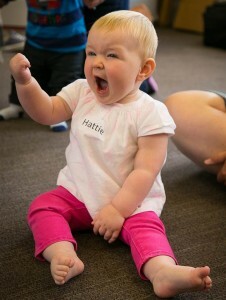 At a Singing Hands baby signing class, our primary focus is on learning language in a child-centred way so that it is motivating, engaging and most of all, fun. And by fun – we mean for your baby AND for you! Always smiley faces at Singing Hands! Happy babies and happy grown ups! 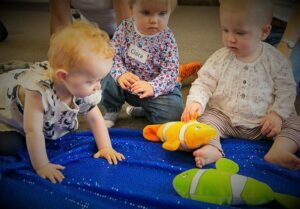 Our courses last for 10-weeks (each class is 40 minutes long) which allows us gradually to build up your baby signing vocabulary. Babies start with us from about 3 months’ old and upwards. 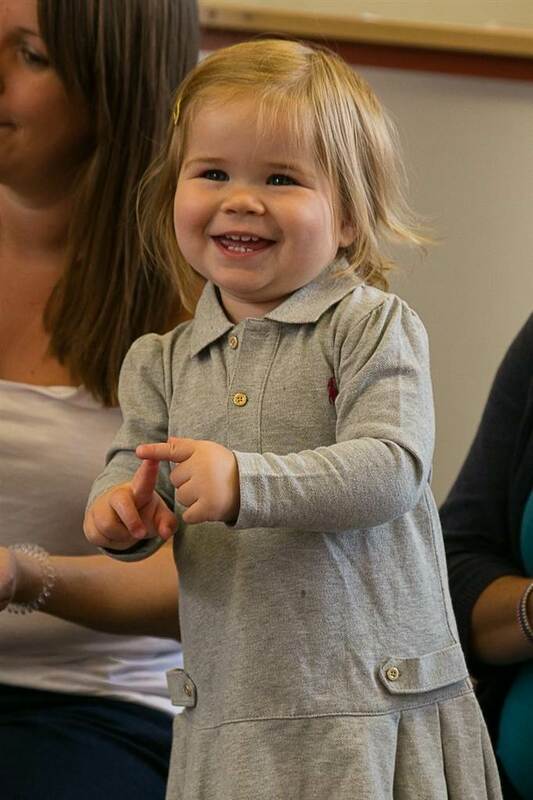 Each week we start the class with a ‘hello’ song so that the children and adults learn each other’s names and this in turn helps to build friendships within the class – an equally important reason for coming to a Singing Hands baby signing class. After this, we introduce a set of key words starting with important baby signs such as ‘milk’ ‘more’ ‘all gone’ ‘food’ ‘drink’, ‘bath’. In our classes we always involve the grown-ups and the babies in some fun activities as a way of teaching new signs and practising ones we already know. This is designed to give you some creative ideas on how to use the baby signs in all sorts of ways throughout the day. It might be a story, a post-box game, bubbles, a pop-up toy or a listening game to inspire families with ideas of what they can play when they are back at home. After these keywords and activities we move onto the singing! 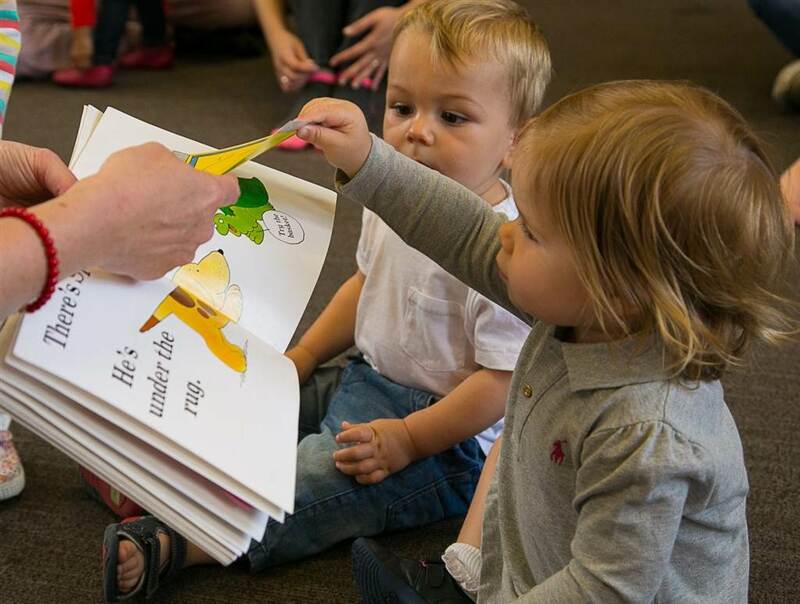 All of the rest of the baby signing vocabulary within the course is introduced through songs and music – anything from emotions, farm animals and jungle animals to daily routines and transport signs and much more. There are some classics from over the years alongside original Singing Hands songs and rhymes. We love to introduce you to and wide range of material to help you build your own musical nursery rhyme repertoire. Singing nursery rhymes is such an instinctive thing to do with your baby and adding some baby signs to these rhymes makes them much more engaging to watch for your little one. Similarly, learning the signs alongside the rhymes is also a great way of helping YOU remember the baby signs when you are at home. 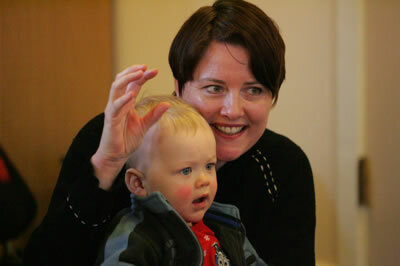 All our Singing Hands baby signing language activities are delivered with our tried-and-trusted multi-sensory approach. Our classes strive to appeal to children’s different learning styles so that everyone in the class is able to learn in their own unique way. 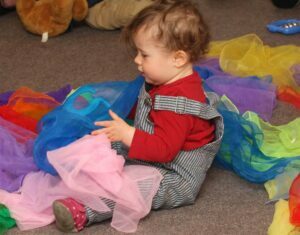 All our classes include lovely sensory props to meet these objectives above – we both come from a special needs background but we know that this sensory approach works for all children. We all learn in different ways and need to experience different visuals, sounds, textures and environments to understand new concepts. Every song has something interesting as a prop – it might be a big rubber spider with a rainmaker and water spray for Incy Wincy spider or voile scarves for Peekaboo, twinkly lights & finger puppets for Twinkle, Twinkle Little Star or sparkly blue fabric and fishes for One, Two,Three, Four, Five. 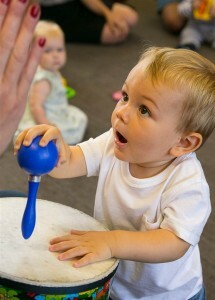 Our big wooden guiro in particular is always a hit with the little babies – a great prop for developing early listening and attention skills. Our tutors sing live to fantastic backing tracks prepared by a renowned professional musician – there is no singing along to pre-recorded vocal tracks in a Singing Hands baby signing class. We sing in a comfortable key for adults to join in and at a much more user-friendly pace than many other classes because we want our families to be able to sign along as they sing. All our music tracks have lovely arrangements with a wide range of musical treatments to suit the theme of the song. 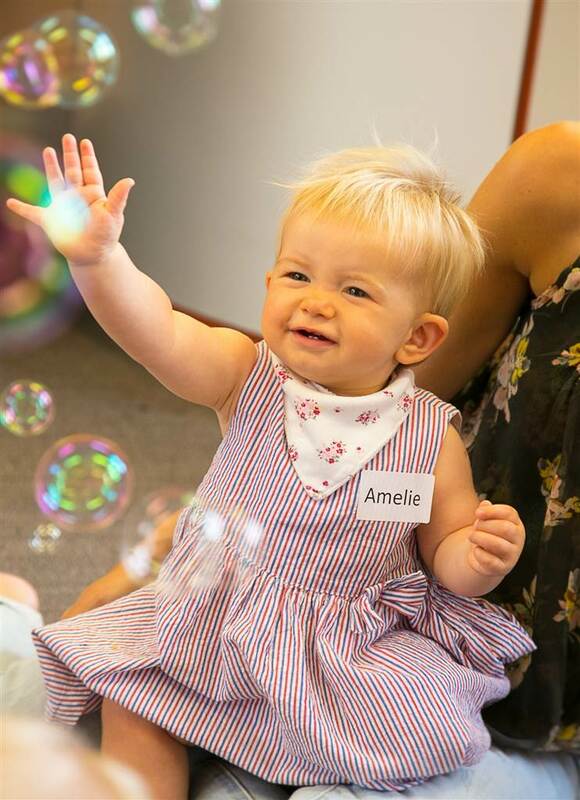 There are all different types of songs for you to enjoy including hello/goodbye songs, warm-up songs, call-and-echo songs, songs in the round, songs with harmonies, lively knee-bouncers, movement songs and gentle soothing rhymes too. 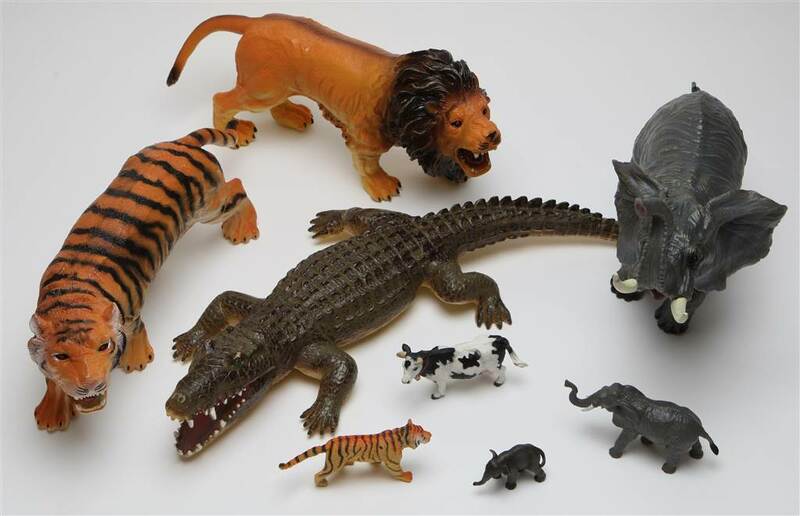 At the start of the term, you will be given a handout of the key words to help you practice at home and our tutors are always happy to help you with any additional or special signs that you might need for a favourite toy or friend. Our baby signing and music classes run during school term time – please click on the button below to find the schedule for available classes near you. We look forward to meeting you soon and starting your baby signing journey with us. Charlotte loves practising her singing and signing at home with the DVDs – brilliant! Henry showing us his signs at home too – clever boy! Sadly, this will be Dennis’s last term with Singing Hands as he starts pre-school. He has absolutely loved his classes, Zuzanna tells me that it is his highlight of his week, and he is more engaged there than he is with any other baby class that she has attended with him. He is now speaking in sentences and has a huge vocabulary but even still, when he’s tired or just trying to emphasise something, he will use his signing to make himself fully understood. Thank you so much, we are sorry that he won’t be able to continue forever! 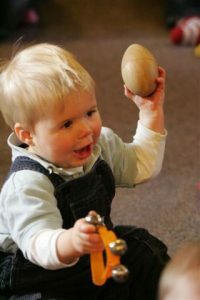 Singing Hands has given my son and I a special gift: it has provided us with hours of fun, but it also gave my son the confidence to start talking, knowing he could be understood, even if the words didn’t come out quite right just yet! Even more fun than described! Can’t wait to come back. I’ve really enjoyed learning the signs myself – I felt like I got my brain going for the first time in a while! Your choice of songs was great and they were mostly new to me. All the signs were explained really well and were relevant to a young baby. I have recommended the course to friends already! We enjoyed it so much that I have booked another course. Am one of your biggest fans! Thank you so much! 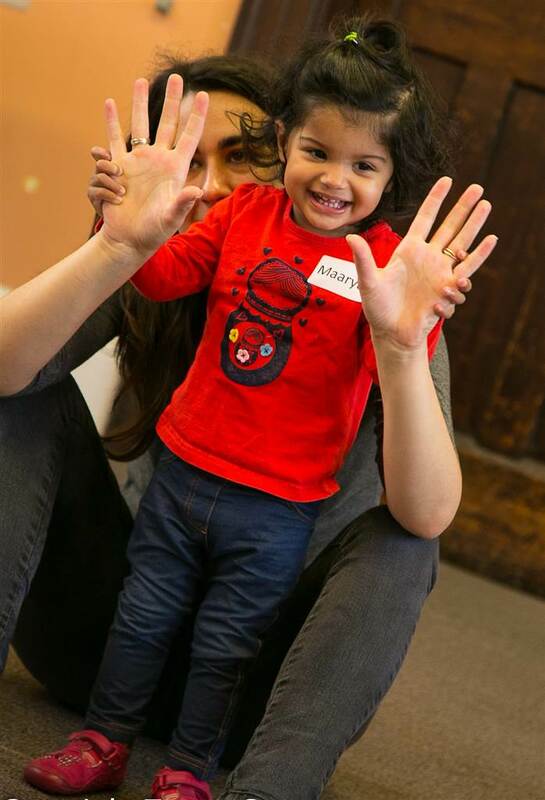 If you live too far away from us but would be interested in signing with your baby, please contact the Makaton Charity and ask for information about their ‘Makaton Signing with Babies’ programme. These courses are available across the UK by other Makaton Regional Tutors. 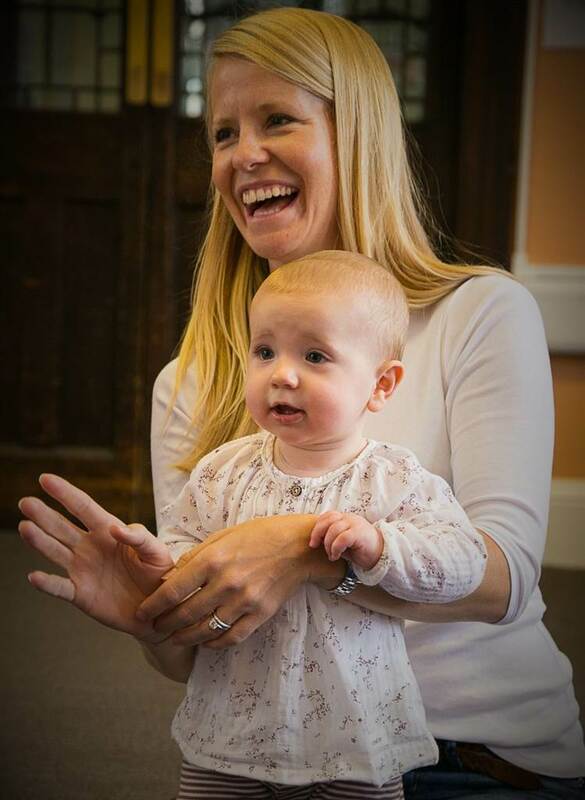 Although these courses are different to Singing Hands baby signing and music classes, they will teach you lots of useful Makaton signs to learn and enjoy using with your baby.